You gravitate toward wardrobe essentials that will always be in fashion. You appreciate a solid blazer and classic pumps. In a word, your style is classic. We totally get you, which is why we put together a list of classic outfit ideas that you'll want to copy. Not only are they super easy to put together, but they're also great for wearing all week and weekend. What's even better is that we've selected the key pieces you'll want to shop too. Keep scrolling for the eight outfit ideas women with classic style will love. 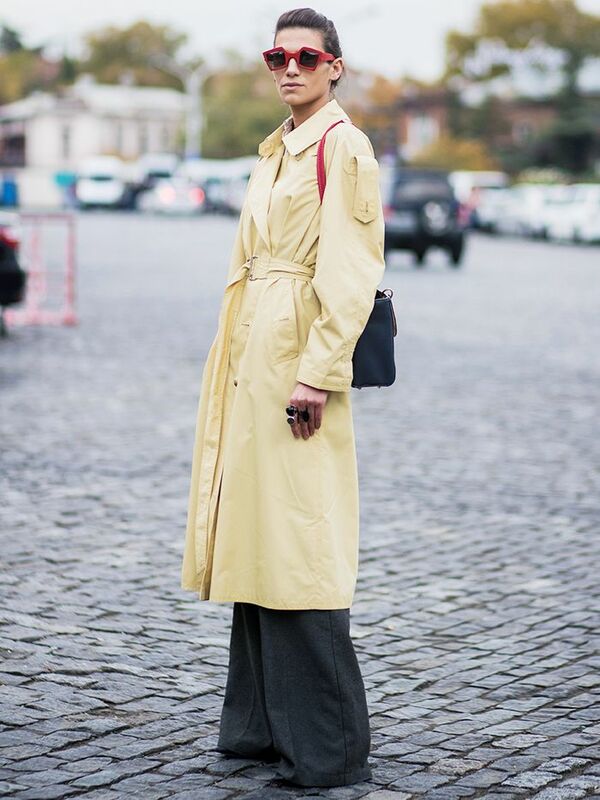 Style Notes: Is there anything easier to wear than a trench coat? Pair that with black trousers and bold red sunnies and you've got yourself a Monday morning outfit that will brighten your day. Snap this one up before it goes. Style Notes: The trick with this ensemble is to tuck the jumper into your skinnies. To make this outfit a little less preppy, add a pair of oversized earrings. Style Notes: Trust Pernille Teisbaek to make an all-grey outfit look amazing. To make sure you don't get drowned out under a sea of muted tones, go for contrasting shades of grey and add some metallic boots to finish it off. Ideal with an oversized jumper or a fitted turtleneck tucked in. Style Notes: A white dress with a white blazer might be best saved for the summer months, but adding a pair of two-tone boots can make it more appropriate for winter. These two-tone boots from Gianvito Rossi are still some of our favourites. Style Notes: The all-black look can be a bit severe, but it's still totally chic. Give it a lift with a slick of red lipstick and a pair of earrings. This looks way more expensive. Style Notes: A long fitted coat with grey skinny jeans and a plain tee is an outfit that suits everyone. Super soft and easy on the purse. Style Notes: One of our favourite go-tos for classic style is Caroline Issa. Her outfits always appear effortless. This is also proof that the black ballet pump will never go out of fashion. Get these in patent so they last longer. Style Notes: As always, a turtleneck is a piece you always want to have in your wardrobe. Happily, there are so many of them around right now and at various prices. Just wear with a long coat, jeans and ankle boots. There are plenty of other colours to choose from if blue isn't your thing. Next up are 41 of the best ankle boots to wear right now.